If another child is behaving badly towards your son or daughter, especially if your child is young and not very good at 'standing up for' himself or herself, it can be very difficult to stand back and do nothing. 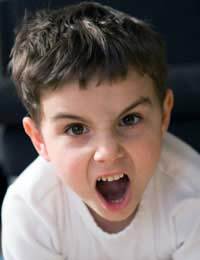 If a child is acting in a bossy way towards your child it may be helpful to talk to your child about how to stand up for themselves with a little more confidence, but obviously if this does not work, or the child's behaviour seems to be verging on bullying, you may want to involve the school in helping to put a stop to it. What Kinds of Behaviour Are Worrying? Schools have a responsibility not only to ensure that your child receives a suitable education, but also to ensure his or her well being whilst on the school property - so if your child is coming home from school upset by another child's behaviour, this issue should be addressed. The kinds of behaviour that the school should be informed about include teasing, being called names, being physically manhandled, having personal possessions like clothes or money stolen or hidden, being verbally or physically threatened, discovering that rumours have been spread about you, or being ignored and left out. If you write to a school to tell a teacher or head teacher that another child is behaving poorly and describe the impact that behaviour is having on your own child, the school has a duty to respond in a full manner. This letter format laid out below shows how parents can write to a school to ask about scheduling a meeting to discuss another child's poor behaviour towards their own child. I consider the boys' anti-social behaviour- and Newman's response- something that should be addressed further and so I would really appreciate the opportunity to come in to school to talk to you, perhaps as well as Newman's form teacher Mr. Whiley, to talk further about what we can do to help alleviate the situation. You can contact me, Rachel, on 0191 2343 9049 or 0723422342, or email me at Rachel@mail.com, to arrange a mutually convenient time to meet and help get Newman and his friends back on track at school. @murk123 - as specified in the article if you write to a school to tell a teacher or head teacher that another child is behaving poorly and describe the impact that behaviour is having on your own child, the school has a duty to respond in a full manner. I hope this helps and that the school's response will help ease the situation. Hi My 12 year old son has been taunted and distracted in school by a girl of the same age who suffers from Tourettes she goads him in every lesson and sings songs about loving him. This is really effecting his education as he has dyslexia and really needs to concentrate in his Lessons. It all came to a head this week when the girl approached him in one of his lessons and grabbed his groin. I have approached the school and they have said I need to put it in writing and they are aware of her fascination with Michael as far as im aware this is not a side effect of having Tourette's. What can I reasonably be as to be done as the way I see it this is sexual assault. At school they have already given me the line that she is entitled to her education and has as much right to be in class as my son but does my son not have the same right ?